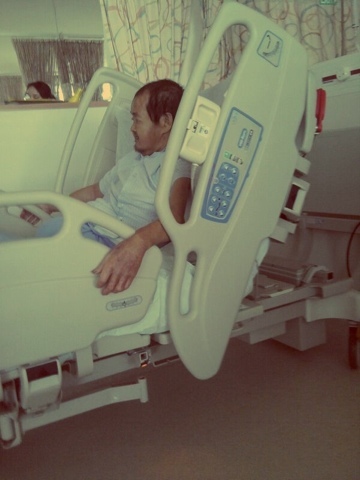 When my father was in hospital last month, the man in the picture above was warded just next to my dear old dad. While he did show his horrible temper towards the nurses, he was fond of Stephanie and myself. He was the absolute sweetest man. We bought him his favourite chocolates and spoke to him when we could. He would always smile and call me 'brother'. It made my day whenever he smiled. The sad thing is nobody visited him. Not one person from his family! The nurses mentioned they tried contacting his loved ones on multiple occasions but I guess he wasn't important enough. Do you know how messed up that is? Wait. It gets worse. The day after my dad was discharged, my chocolate loving friend passed away. Stephanie and I didn't get to see him but we were told that he asked for us. I cried that night when I found out about his passing. Nobody deserves to die alone. I don't care what he or she may have done. I hear it happens a lot in Singapore. Download the Singapore Police Force app and you will see lots of appeals by SPF. Maybe we need the law that was recently passed in China. The law where YOU need to visit your elderly parents. After all, it seems some of us do not know our priorities. Family comes first and should never ever be forgotten no matter the circumstances. ps: There was another old man named Henry. Sweet old man that smiled whenever he saw me and never failed to ask how my day was. I still find it unbelievable that his wife and children kicked him out of the house because he was deemed 'useless'.